Will the baking curse be lifted? This may be an unpopular opinion, but I’m not much of a sweets person. Before I met Kris, I never ordered dessert at restaurants (that has since changed...) and I didn’t touch baking supplies for approximately 364 days out of the year. To clarify, I’m still a human, and I appreciate a rich, dark chocolate ganache every now and then. But you can keep your candy, chocolate bars and cookies in an unlocked drawer. I won’t touch them. There is, however, one exception to this rule. As a kid, I was blessed (and cursed) with parents who made incredible, fresh fruit crumbles. Normally, my dad would buy the fruit in bulk from a farm stand down the road, and a few hours later, the smell of slowly simmering sweetness wafted through the house. This gooey, fruity goodness was topped with a buttery, oat-filled crumble, and if we were super duper lucky, mom would throw a dollop of whipped cream on the final product, for some added decadence. I’m not sure why I’m so enamored with crumbles, but I think it has something to do with the balance of it all. I don’t enjoy the one-note texture of a big, fluffy piece of cake. It’s boring, and in my opinion, way too filling. But fruit on the bottom and buttery crumble on the top? Now that’s a winning combination in my book. A lot of useless backstory about my dessert preferences, huh? Well yes and no. And that feels pretty monumental, considering my aforementioned history with desserts. And it’s not just any cake. It’s the apple cake recipe from Kris’ mama, and it’s the perfect equation of a thin, moist cake, oodles of fresh apples, and, wait for it... a crumble topping! 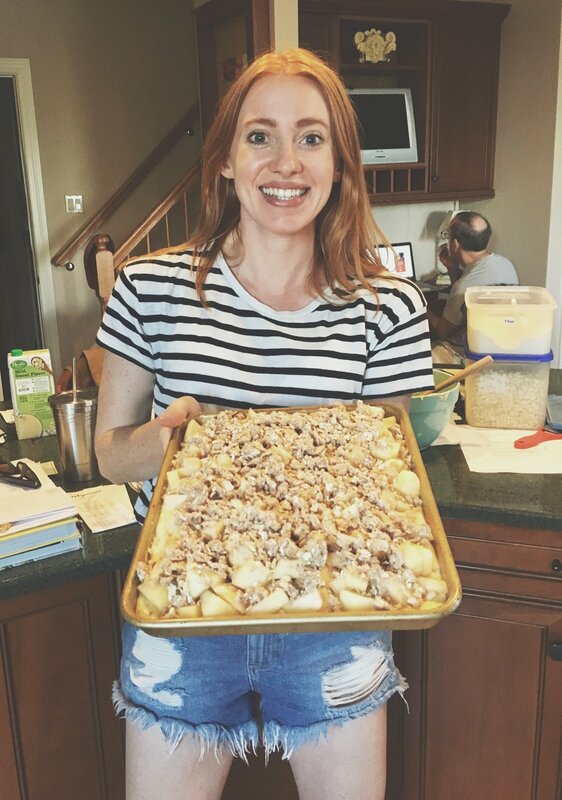 It’s heaven in a sheet pan, and I am solely responsible for the demolition of too many pieces of said heaven. It’s apple season in the states, and I’ll take fresh picked apples over a pumpkin spiced candle any day. So there I was, faced with enough apples to feed a small country, and immediately the image of my newfound lover, I mean cake, popped into my head. I had to make Kris’ Mama’s Apple Cake. Well, somebody else came up with the recipe, but she makes it best, so I’ll give her the credit. At this moment, I had a bit of an internal panic. I’m a very bad baker. Last year for Kris’ birthday I made a cake so absolutely terrible, that even the mound of pink sprinkles and powdered sugar I loaded on the top couldn’t save it. Baking is a science, and I’m more of a liberal arts girl. But I really wanted my parents to taste this cake, and they certainly had apples to spare. Time to put my Big Girl Pants on, and start peeling and chopping! That is, until I realized the recipe was in GRAMS. In ‘Murica we don’t measure with grams. Ok, power of positive thinking! I can convert it to ounces! Well 1 Gram = .035 Ounces. Scratch that plan. Remember that liberal arts background? Enter my superhero of a mother pulling out the food scale. (Because she’s a professional and is prepared for these things, while I, on the other hand, am not.) So it was time to fully embrace my new European home, and bake like a European, with a handy little European scale. Y’all. I had so much fun with that scale. Not to mention, it seems wayyyyyy more precise than a plastic “cup” of something here and there. So I was mixing and stirring and jamming out to some John Denver (as much as one can “jam" out” to John Denver), and the cake actually started coming together. The velvet cake batter perfectly lined the bottom of a small sheet pan, and I piled oodles of fresh apples on top, and coated it all with the crumble topping, to which I also added oats for a bit more texture. As I pushed it all into the oven, I said a prayer, hoping that the baking Gods had laughed enough at my previous cake, and could really look out for me on this one. I made a delicious cake. It actually worked! And it was a hit! When I tell you this cake is a crowd pleaser, I am not lying. It’s perfect. I have to give credit to the little baking scale for this one. Without it, I would’ve been lost, and most likely recreated my tragic concrete block from a year before. Turns out these scales aren’t super expensive. Take a peek at a few of the best ones here. Below, you will find a recipe. I promised not to post recipes, but with this one, well, you need it. It’s adapted from a German website, Kochbar.de which isn’t terribly specific, and leaves a lot open to interpretation (AY liberal arts is back!) To be sure everyone else gets the same enjoyment as I did from the recipe, I’m leaving some of the rough translation in tact. Have a chuckle, and Guten Apetit! the measurements below will fill one small baking sheet. Work over a smooth dough and then fold in the flour and baking powder and beat vigorously. Spread the dough on a greased baking sheet and then cover with the apples and then with the sprinkles (“Sprinkles” is the code word for crumble). Bake at 175 ° (350 fahrenheit) for about 45 minutes. And that’s it! Take your pretty lil’ treat out of the oven, let it cool for 30 seconds (ok, longer, but I really wanted a taste) and enjoy! have a go at the recipe, and share your thoughts or suggestions in the comments below!